Another way that I like to make articulation therapy fun is by getting out my toy grabbers and having my students pick up articulation cards! This is great as an individual or a group activity. 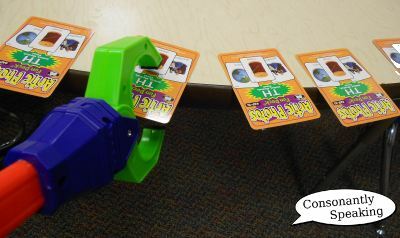 It also involves fine motor skills of being able to grasp the handle and pull it to clasp onto a card. First, I place articulation cards for the sound in which my student(s) have goals for on the edge of the table. 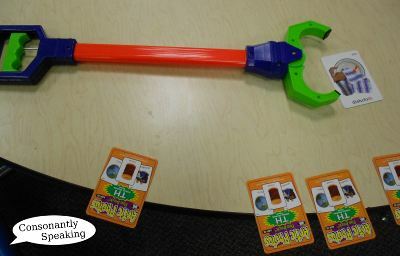 Then, I hand them a grabber and tell them whomever grabs the most cards wins the game! If I have students who are focusing on different sounds, I tell each student to pick up the cards with their sounds on them and see who can get all of their cards the fastest. 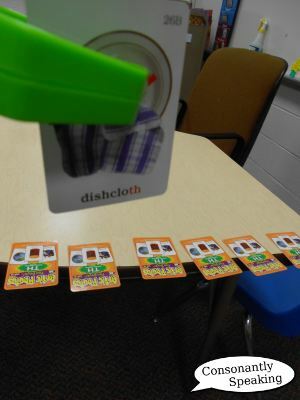 Once my students are finished, we count up the cards and look at the side of the card with the word with their sound on it. Each student states their word or states their word in a sentence (depending on which level they are at). My students love seeing how many cards they can get, so I get a lot of sound trials in a session. They even love picking things up to clean up at the end of the session with the grabbers. One of my parents stated that their student had so much fun with the grabbers, they wanted to get one to use at home! I purchased my grabbers at Target for around $4-5 each. I purchased two so that I could use them in group therapy where I have two students working on articulation sounds. I love seeing the smiles on my students' faces when they do hard work but can have fun doing it!